HP 2055 , CE505X , HP P2055dn Toner is a HP black CE505X cartridge for use in your laser printer. This HP 2055 toner delivers excellent print value. 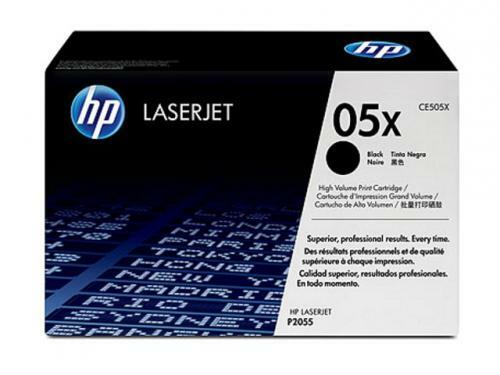 This CE505X , HP P2055dn Toner is a HP black toner cartridge. HP 2055dn , HP P2055 toner made from a genuine CE505X toner cartridge. For use in: HP LaserJet P2050, P2055, P2055D, P2055DN, P2055X, 2055, 2055dn Printers. Note: This cartridge DOES NOT FIT the HP LaserJet P2035 series printers. Replaces part numbers: CE505X, 05X, CE505A, 05A. Page Yield: 6,500 @ 5% coverage, High Yield .